The library is accessible has automatic doors and a hearing loop is installed. Please see:Library services for people with disabilities, for further information. 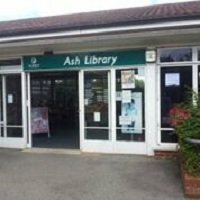 Ash library is situated on the main road through Guildford to Aldershot. It is between Tiltham's Garage and Ash Walsh School but on the opposite side of the road. The library has its own large car park at the rear with one disabled space, access is in Star Lane.